While most crypto currencies have been crashing hard this week, it's been encouraging to witness few high profile tech people keeping the long term focus and openly discussing about which jurisdictions are more likely to become the Silicon Valley of crypto. It all kicked off with Jason Calacanis' tweet claiming angels can only do “meh to ok” outside of the Valley. Fred Wilson came back pretty hard, ultimately stating how “the most disruptive startups of the last 10 years (BTC $40bn & ETH $20bn) did not emanate from SV”, echoing bits from his memorable post on "Return & Ridicule" (if you haven't read that, delete your account). If that wasn't enough, the day after he followed up with a post titled “Jurisdictional Competition”, where he succinctly pointed out how the US and Silicon Valley have the most to lose from a crypto-unfriendly local regulatory environment. A secular US tech decadence does not seem far fetched at all, particularly as it's effectively already happening: US VC is now 54% of global VC investment, down from 90% 20 years ago. "where will it be 20 years hence?” Scott Kupor from A16Z asked on Twitter. Our not so wild guess is around 20-30%. There was more. Matt Ocko, who runs a deep-tech fund from SF, claims that their typical founders do not fit the Silicon Valley cliche and in fact less and less of their portfolio companies every year are based there. Boom. All this gets exacerbated by the current political context. The Trump administration is clearly going to make it painfully difficult (and unwelcoming) for immigrant entrepreneurs, without which "America will Fall Behind", says Steve Case. Brad Feld picks up on it saying how great this will be for the rest of the world. It's not hard to spot and extrapolate this trend, is it? Ignoring it is like driving while looking in the rear view mirror. Going back to crypto, it is a romantic coincidence that Crypto Valley happens to be right at the heart of Europe. Switzerland no doubt has the chance to build onto its regulatory edge and create a thriving world class crypto ecosystem, and Europe will inevitably benefit massively from a healthy pumping heart. But other countries are not just going to be waiting on the sidelines, it's probably not going to be the usual suspects though. Back on the ETH price, this feels very much like the 2013 bitcoin price deflation. ETH rose spectacularly in the past months, but this is a long game. It may go down more, and it may take a few years to see it back at its ATH. We're here for the amazing innovation happening in decentralized computing. The main difference I personally feel today vs the 2013 price hike is that 4 years ago, it was clear BTC was revolutionary and in the future could become important, but it wasn't clear how. Today, I think it is abundantly clear that the second-wave of blockchain technology is here, and is even more revolutionary than we could have imagined. Distributed trustless ledgers and global smart computing are here to stay, and we can only imagine what else is coming. The revolution has started, and it will be decentralized. We are tracking all the emergent crypto funds. If you do know of any under-the-radar fund being raised / invested, please share! We have 38 now representing more than $2B of capital. We will publish as soon as we have some additional research. In the meantime, you can read Laura Shin's post where she lists 15 crypto hedge funds in the process of raising capital. Also, if you are in London, this is what you could see at a bus stop..
A good non-technical primer on the blockchain potential, by The Economist. They compare the blockchain to double-entry bookkeeping (made in Italy 🇮🇹 btw) and then go on to list a number of use-cases and known issues. This is a good podcast if you are intrigued by Numerai. One thing that caught our attention is that apparently a fund has purchased a large block of $NMR from an exchange with the intention of hiring a bunch of data scientists and then lend them the tokens so they can stake them on Numerai. Ecosystems can evolve in ways that are not immediately obvious. Aragon's team talks about the building blocks of the decentralised technology stack, which are coming together one by one. I have been personally extremely interested in seeing how some pieces of decentralized technology are becoming standard building blocks in the token economy. This is where the biggest opportunities still lie and why I am so bullish on Aragon and 0x. Trent McConaghy from BigchainDB addresses how various protocols can interoperate as building blocks of a decentralised application stack. A meticulous dissection and commentary of Naval's epic tweetstorm we reported on a few weeks ago. A good summary by Jorge Stolfi on how the Bitcoin block size debate came about. Politics! This was a dark story this week. AlphaBay, arguably the #1 deep web illegal-products marketplace on Tor disappeared. People started thinking about a run-off, but it was then clear that the founder was busted in Thailand by a police force with help from US / Canadian authorities. He was then found dead by hanging in his cell, as extradition was being prepared. This got way more attention than I expected, and it seems like it's a big deal for the US. Yes, the chart is cumulative. But the number is still staggering. That’s more than all VC investments in the blockchain space in 2015 and 2016 *combined*, according to Tokendata (who will kindly provide us with this chart every month). The numbers above make this a pretty low-key ICO, which is probably a good reason to pay more attention to it. Florida-based Encrypgen enables an open and secure channel for genetic data storage and compilation, enabling next generation genetic database management through use of Blockchain and encryption technology. Currently in beta testing. - 80% of tokens sold via crowdsale, 10% retained for the dev team, 10% reserved for marketing and bonuses. VC-backed Tierion developed a 'proof engine' called Chainpoint. It's now launching the Tierion Network and its token to scale a universal platform for data verification. The Tierion Network Token (TNT) is meant to provide economic incentive to secure the network, while also serving as a the internal currency to access network. Encryptgen - next generation software for securely storing, sharing, and protecting genomic data. Agrello - legally binding smart contracts, powered by AI. Monetha - decentralised Ethereum-powered payment solution for merchants that enables trustful commerce. Delphi - a truly decentralised prediction market. Zeppelin Solutions have released Coral, an off-the-shelf fundraiser platform for Ethereum tokens. This will bring much needed standards to token sales. The recent Bancor shenanigans have highlighted the the importance of ensuring that smart contracts are correct and free of security vulnerabilities. The folks at Software Reliability Lab, the research group from the Department of Computer Science at ETH Zurich, have released Securify, the first automated system for formal verification of smart contracts. Aventus is a nice Ethereum-based ticketing solution’s. They just released the alpha on the Rinkeby public test net. Usage instructions in the post. The UK’s central bank has released new details about a proof-of-concept it has developed in partnership with distributed ledger startup Ripple. Following Brazil's footsteps, Lantmäteriet, the land registry of Sweden, officially started to use Blockchain technology to register land and properties via a partnership with Chromaway. Thanks to a partnership with BitPanda, Austrians will be able to directly exchange Euros for Bitcoin (and Ether soon) at 1,800 locations. What a team that will be folks, some of the best minds in crypto are coming together. Chris announced he was leaving ARK last week and now we know what his next gig will be. $100 million target for the fund, which will be called Placeholder Capital (we can only imagine how they came up with that name...). Proof Ethereum will "engage in mining of ether, in buying and selling mining contracts and royalty agreements, and will provide 'proof of stake' and other technology services related to Ethereum," as well as hold ether as an investment, according to the company’s offering document. $250m (or 1 Tezos...) target size. At time of writing we are off c. 45% from all time highs, it's been a literal bloodbath this week. To everyone who keeps calling it a bubble, you can stop now as it kind of already popped. Everyone is now wondering how much further it's going to fall. 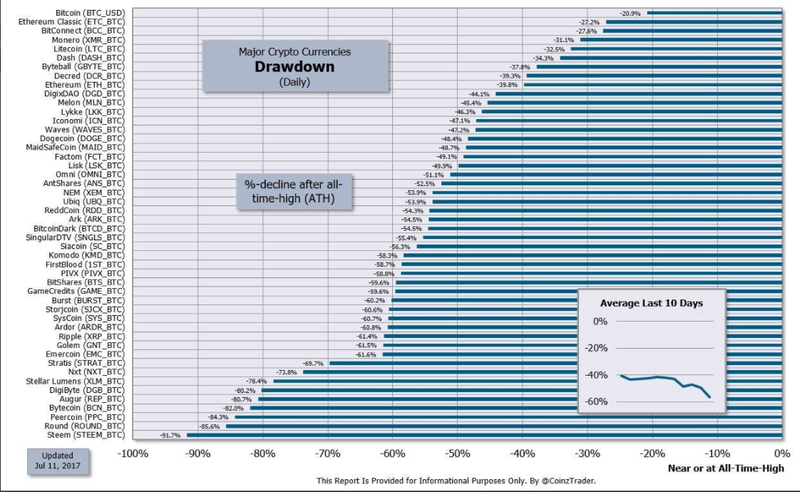 Chris Burniske in his first Medium post argues that even a 75% drop from ATH would not compromise the secular bull market. We also think we may not be quite done yet...and it's actually a good thing: "Run, day traders. Run, speculators. Come, believers. Come, builders." A potential leading indicator seems to be Tether ($USDT) market cap. As a reminder $USDT is a 'stablecoin' i.e. it's pegged to the value of the U.S. dollar in its reserve fund. While it's price is constantly in the close proximity of $1, its market cap can go up or down as $USDT coins get created when one buys them or destroyed when one sells them. At the time of writing $USDT market cap is at an all time high at just shy of $300m, almost 3x since June 1st. A reddit user suggested that Tether acts as a 'safe harbour' for traders to get into to avoid sharp corrections in other crypto currencies (others are questioning its safety), while implicitly signalling the intention of getting back in during calmer times (instead of cashing out to fiat and perhaps exposing to potential tax liabilities). We are still thinking whether there is any merit in this argument and whether $300m would actually be enough move markets in any meaningful direction, but will keep an eye on it going forward. It could certainly get a lot bigger before getting smaller. Chaincoin ($CHC) had a great week and despite the correction over the weekend it is still up 5x over last Sunday. And you won't believe why, or maybe you will...This one and the Useless Ethereum Token ($UET) are effectively economic experiments in tribe-building without any particularly sound fundamentals . Just be careful out there! Revolut, one of the emerging European neo-banks with +700k users, just closed a $66m funding round to target US and Asia expansion and to enable in-app cryptocurrency purchases, sales, and transfers. "Users will now be able to hold, exchange, spend and transfer bitcoin the same way they use other currencies. Rival cryptocurrencies ether and litecoin will soon be added”. It will be interesting to test the implementation and monitor adoption. Provenance wants every product to carry accessible, trustworthy information about origin, journey and impact powered by the blockchain. DCG is amongst the investors in this round. Japanese energy conglomerate TEPCO has led Conjoule's €4.5m funding round. Essen-based Conjoule develops P2P marketplace for producers and consumers of renewable energy to transact with each other without the need for traditional intermediaries. PS: We'll be in Berlin on August 7-8, would love to connect with anyone local who's working on or investing in blockchain technologies. Reach out on Twitter!